Everyone knows any festival is about the music and we have the bands that are defining and redefining the country music scene. 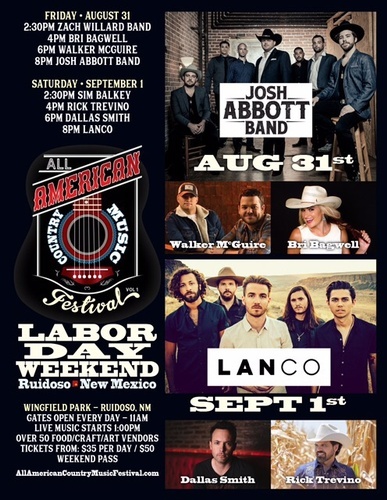 Lanco headlines the show Saturday night and the Josh Abbott Band makes Friday just as spectacular. Explore the Texas sounds of country all day Friday starting out with the Zach Willard Band followed by Bri Bagwell and Walker McGuire and finally you’ll want a “Front Row Seat” for Josh Abbott Band. Listen to nation-wide country all day Saturday when we kick it off with Sim Balkey, bring out Dallas Smith, continue with Rick Trevino and wrap the night and festival with what will no doubt create the “Greatest Love Story” of the year with Lanco.